Airbus files around 600 patents each year, but one in particular made international news in 2015, sending news site comments sections into meltdown as the public swore it was the last straw in cramped travel conditions. Outraged comments ranged from oaths never to fly again if the design became reality, to comparisons with sardine cans, and even 19th century slave ships. The cause of the uproar? 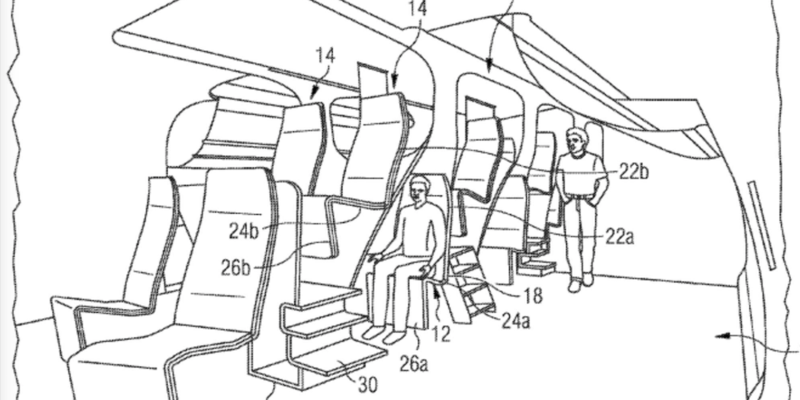 A patent application for a double-deck business class cabin. 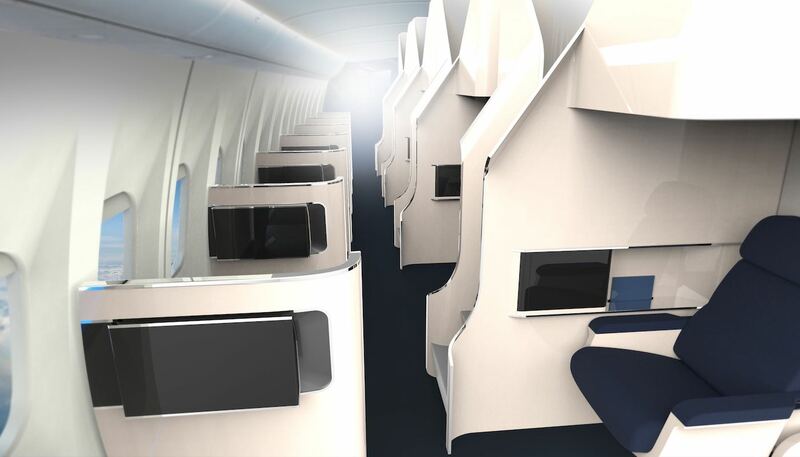 The idea of monetizing the vertical space in the cabin is something every major airframer, airline, design house and seating manufacturer has explored at some point, but clearly no such ideas have been implemented in recent years. Is it that the market isn’t ready for a second tier of seating, or is the idea simply not viable in the real world? “Innovating with LOPAs in the traditional way is becoming more difficult with every new patent that is published. The landscape of IP is growing ever denser, and this makes the third [vertical]dimension very appealing and indeed interesting,” says Anthony Harcup, an associate at the Acumen transport design consultancy. Harcup adds that if vertical cabin space is to be used, careful consideration must be given to whether people will be prepared to embrace a travel experience that offers different benefits and drawbacks to today’s norm. Let’s explore some expert opinions to assess the risk and reward of creating an additional level of seating. If the aim of adding a second seating level is to increase cabin density, would it really work? After all, while the upper tier gives an opportunity to add more seats, you may lose some of that benefit as lower-level seats are removed in order to provide a means to access that space. However, if using the vertical space isn’t considered as a mere ‘pack ‘em in’ exercise, it begins to make a little more sense. “Is this really just about adding seats? No, I think it is about whether you can actually change the degree to which somebody can recline and offer greater comfort in a reclined position, but still maintain a reasonable level of cabin density,” adds Darbyshire. Mezzanine seating seems to have potential in terms of cabin capacity and human comfort, but how does it stack up in terms of meeting aviation requirements? Would the added weight and stress created by a second level make it through the certification process? “The biggest challenge is neither the design nor the engineering. It is the certification,” warns White. He states that there would be “an awful lot of leverage” going through the floor, but that by fixing the seating to both seat tracks and ceiling attachment points, it could work. Harcup has a similar view to White, saying that the effective use of vertical space for passenger seating depends on closer collaboration with the airframers to provide ‘flex-zones’ where upper attachments are possible – enabling the construction of floor-to-ceiling structures that are certifiable. 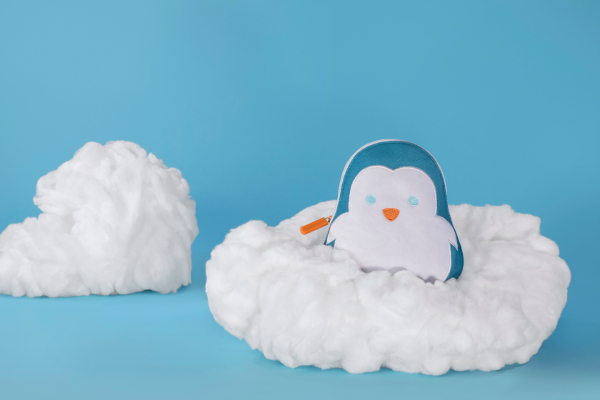 “This could unlock a whole new generation of design thinking,” he states. The basic idea of stacking composite pods on top of another, attached to conventional seat tracks, has been explored extensively by Tangerine. In the case of Tangerine’s Club Limo concept, it was envisioned that the two levels of seating would be attached to the existing seat tracks, with no other hard fixings required. However, Darbyshire is also of the opinion that it may be possible to attach an upper deck to other points in the airframe. “But you are definitely going into unknown territory to some degree and it’s potentially going to call into question the way the dynamic tests are currently carried out,” he cautions. “Therefore you are going to have to allow quite a lot of development time if you are going to take risk out of the program. Another major practical issue of adding an upper level is that of access and egress. Steps will clearly be a bar to access for some passengers with limited mobility, and they may create potential issues for the 90-second evacuation requirement. “There are very real challenges along these lines, which have prevented many ‘stacked’ passenger seating solutions from being commercially viable,” states Harcup. Acumen has a yardstick for assessing cabin concepts, which in an industry that loves technical terms and acronyms, is the charmingly low-tech ‘granny test’. If Harcup feels that his grandmother wouldn’t be able to get into or out of a passenger enclosure without discomfort, then he feels its design is likely to discount a large volume of the market. “Solutions involving the vertical space must carefully navigate and compensate this issue”, he says. Another practical consideration is that as the center overhead stowages are removed, the center PSUs go with them. Lighting and crew call buttons are not difficult to relocate, but oxygen masks present a bigger problem, for both lower- and upper-level guests sitting along the centerline of the cabin. Chemical oxygen generators could be fitted into the center seats, but they are not a lightweight solution. Darbyshire instead proposes reconfiguring the current gaseous manifold systems into a different location that can be accessed by both levels of passengers. From the views given by these cabin design experts, it seems that business class cabins could benefit from a second level of seating – and that it is not an entirely implausible idea. But what of economy class, where the potential cabin density benefits of tiered seating would be of great interest? Many of the outraged comments about the Airbus patent seemed to mistake the concept for an economy cabin idea, but are their concerns unfounded? However, Orson warns that in some cultures the idea of having someone sitting above is not appealing, and that customer demand for upper and lower seats would have to be carefully considered before committing. He adds that perhaps the upper seats could attract a premium. For those wanting space, with the double deck running along the centerline of the cabin, the outer rows would still offer a more spacious feeling – and perhaps the window seats could also attract a premium. Our panel of designers seem confident in the potential of the concept of tiered seating. 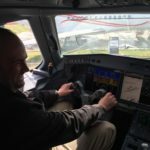 Whether we will see it fly or not, it is interesting to see an exploration of new ways of integrating seating with the airframe for potential airline and passenger benefit. The space may be finite, but why should the way it is used be finite? “I think there is a whole central set of disadvantages to it that really call into question whether it is a sensible thing to do. Do the benefits outweigh the disadvantages? I’m not sure they do. It is certainly inventive, interesting and different, but is it good enough? I think the answer is no. “I think some of the thinking in it is actually quite interesting and quite powerful. I think there are aspects of it that are very questionable, but then again it depends on what Airbus’s strategy is, and we don’t know what its strategy is. Do our panel see potential in the premium economy cabin? Perhaps a second level would work well in premium economy, or even as a hybrid cabin with economy on the lower level and premium passengers having a slightly more luxurious and personal experience above. 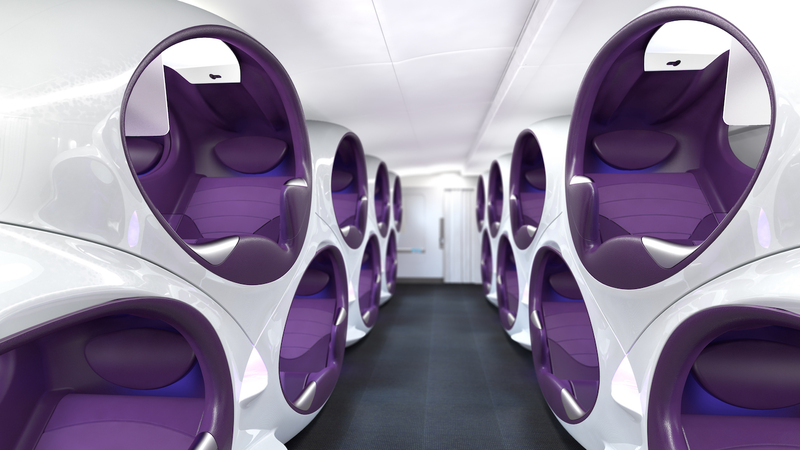 Factorydesign was challenged to create a fantasy concept for Contour (now Zodiac Seats UK), and devised the striking Air Lair design, which was a double-deck system of individual pods, claiming to offer 30% additional passenger accommodation in the same footprint as a single-deck layout. The concept lay somewhere between premium economy and business class. 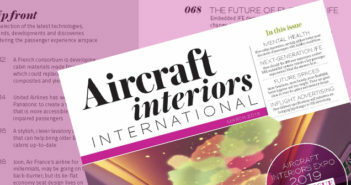 The concept had a very mixed reaction at its reveal at Aircraft Interiors Expo 2012, but White has noticed a recent increase in people approaching him to talk about the validity of Air Lair as an idea, as more people are seeking new ways to optimize cabin space. It seems an upper level of seating is possible in terms of engineering, but one of the biggest problems could lie in the service aspect. No top-tier airline will want its service standards to decline as a result of a redesigned cabin. 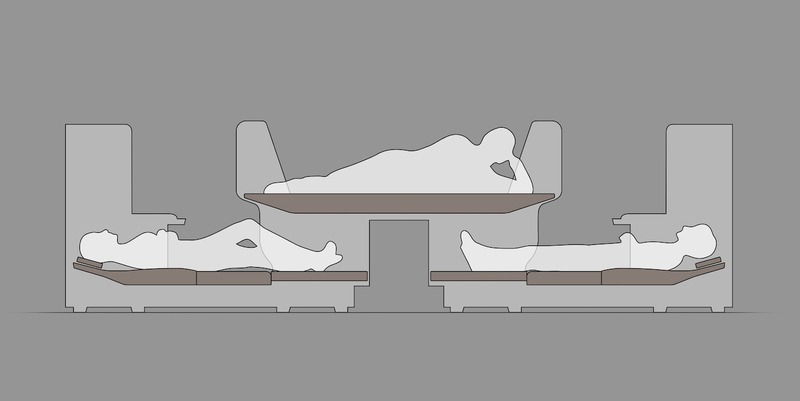 In the mid 2000s, Robert Henshaw, a partner at Formation, noticed that wide-body aircraft cabins were generally becoming taller, and began thinking about the possibility of using some of this space to layer the bed and seat arrangements, creating higher passenger density without compromising passenger living space. 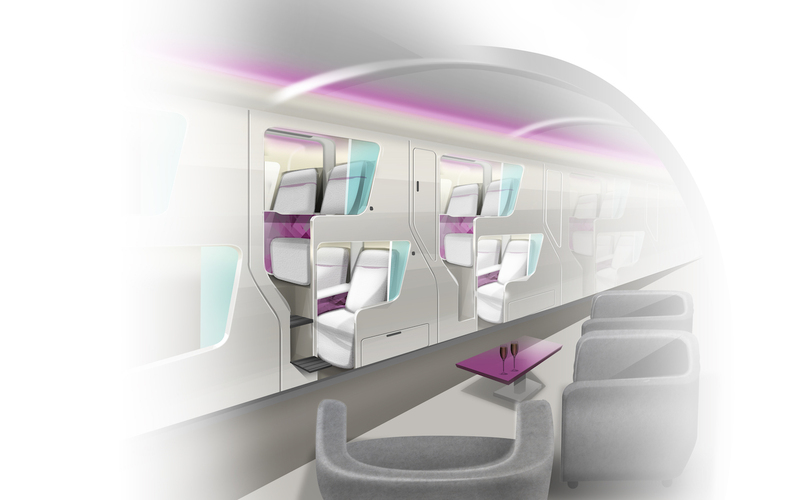 Henshaw has created a few layered seating concepts, the latest featuring an arrangement of two forward-facing and two aft-facing lie-flat seats, which are separated by a raised premium class suite with living space comparable to a first class suite at a pitch of 80in or more. The standard business class seats that bookend the suite underlap the armrest areas of the suite, and when the suite converts to a bedroom, the bed overlaps the armrest and thus the lower leg area of the four bookending seats. The lower positioning of the bed provides two advantages. The first is more vertical space in the footwell to better accommodate crossed legs, while the second advantage is improved step-over egress for the window or center seats. The concept is well suited to several aircraft types. The high-density 1-2-1 suite and 2-4-2 standard lie-flat arrangement is suitable for the A350, A380 main deck and B777. A more spacious but less dense arrangement of 1-1-1 and 2-2-2 would work well for the A330, A380 upper deck, and B787. For single aisle, a 1-1 suite and 2-2 standard lie-flat arrangement would be a very compelling transcon product offering. In a 2-4-2 B777, Formation claims that an overall seat gain of 17 lie-flats is achieved, compared with a typical staggered or herringbone LOPA. The cabin is comprised of 46 standard lie-flats and 11 premium suites. According to the studio, the ability to offer 11 premium suites and still have a higher count of standard lie-flat seats could be a game changer. As part of an airline pitch, Tangerine developed the Flex concept, which gives window seat passengers a separate bunk located above the inner seats. The two spaces are entirely separate, giving window seat customers a comfortable reclining seat for TTOL, working, dining or watching films, and a separate, dedicated and private sleeping area across the aisle and up five steps. “From a customer proposition point of view it’s really powerful,” states Martin Darbyshire of Tangerine. While the inner passengers do not have access to the mezzanine-level bunks, their seats do convert into lie-flat beds. 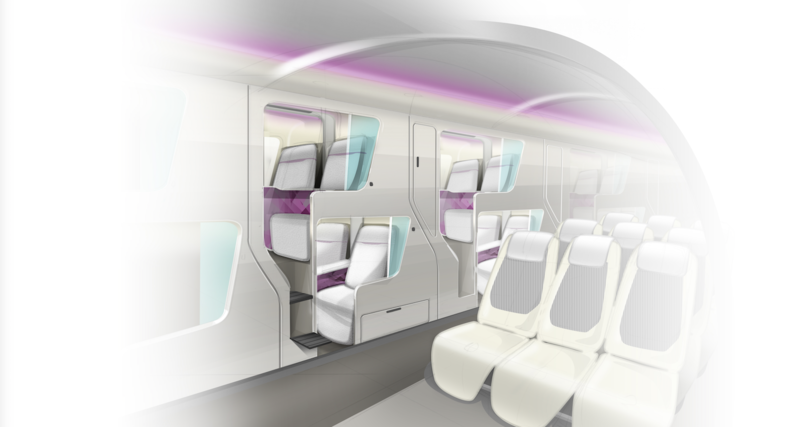 The concept sketches show the inner seats facing sideways in the cabin, but that is not a necessity for the arrangement to work, so long as there is sufficient space for the center seats to be converted into flat beds.